Here's one big clue: This defense contractor depends greatly on one civilian business in particular. Oshkosh trucks basically are the military's motorpool. Image source : Oshkosh Corporation. On Wall Street, earnings season marches onward, and this week it's all about the defense contractors. Many of the bigger names in defense have reported already, but several significant players still stand at attention and ready to report. 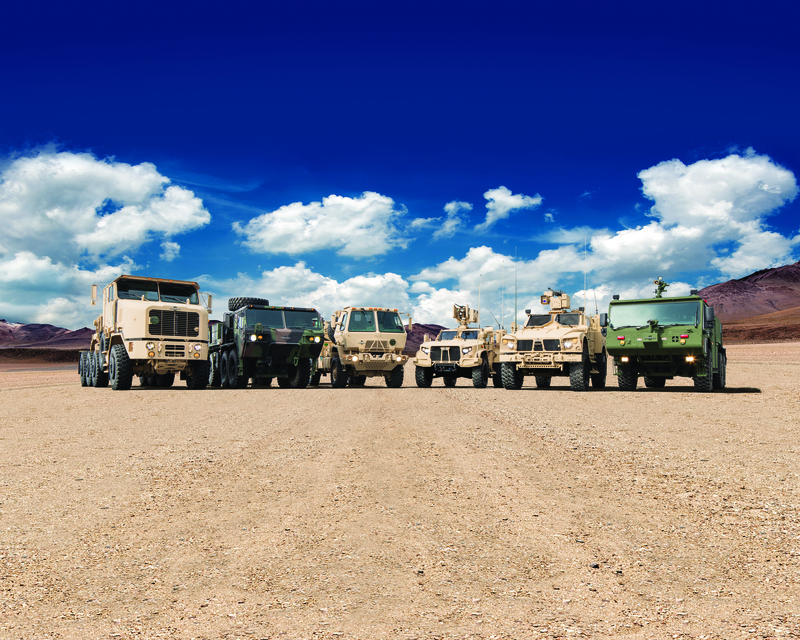 The next in line is Oshkosh Corporation (NYSE:OSK), maker of heavy, medium, and light trucks for the military -- and quite a number of trucks for the civilian sector as well. Oshkosh reports fiscal second-quarter 2016 earnings tomorrow. Here's what we know today. Buy, sell, or waffle? : According to S&P Global Market Intelligence, 17 analysts follow Oshkosh stock. Ten rate the stock a "buy," five more rate it "neutral," and only two say "sell." Revenue: On average, analysts expect to see Q2 revenue fall 12.5% to $1.36 billion. Earnings: Profits may plummet even further, falling 47% to $0.43 per share. Back in January, most contractors were reporting their full-year 2015 results. Oshkosh, however, which marches to the beat of a different fiscal calendar, reported its Q1 numbers. With revenue down 7.5%, and profits down by more than half, those numbers were not good -- but it wasn't the Pentagon's fault. Oshkosh blamed Q1's poor performance on "lower access equipment segment results." In contrast, results improved at Oshkosh's fire and emergency segment. Meanwhile, the company's defense business has finally been cleared to begin ramping up work on the Army's Joint Light Tactical Vehicle program after a six-month delay following Lockheed Martin's multiple protests of the award to Oshkosh. Ever the good news-bad news company, Oshkosh also noted that an expected international sale of 1,000-plus M-ATV armored cars has been "slowed." Revenue from that deal is still on the way, but is unlikely to arrive before fiscal 2017. By now, you should have a pretty clear idea of what we're going to be looking for when Oshkosh reports tomorrow. First and foremost, we'll be looking for updates on the timeline of the Army's expected multibillion-dollar buy of JLTV armored trucks. The contract has the green light to proceed, but we want to get a better feel for how quickly Oshkosh is ramping up production, how many units might be delivered this year -- and how much money Oshkosh will get for them. We'll also be looking for a clearer picture of the M-ATV sale. Is it only delayed into 2017, or is the sale in actual peril of cancellation? At an estimated cost of nearly $500,000 per unit, this is a big deal for Oshkosh -- a $500 million deal, on which nearly 10% of the company's annual revenue depends. Perhaps most crucially of all for a company we've come to think of as primarily a defense contractor, though, is the health of Oshkosh's access equipment business. No matter how great-guns the defense business goes, Oshkosh still depends on access equipment to produce more than half its annual sales. Those sales have slowed lately, however, and with high fixed costs, that's making it hard to earn profits. The strong U.S. dollar isn't helping Oshkosh win new business, either. For this one particular defense business, it's the health of the civilian economy that may prove the most important thing to watch of all.